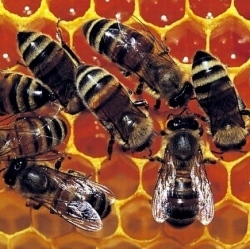 How honey bees as a group decide on things, such as where to build their nest, mimics the operation of the human brain, with each bee in the “superorganism” acting like a neuron in the gray or white matter, researchers at the University of Sheffield, in the UK, have announced. Their findings were published in the journal Scientific Reports. This has implications not only for neurology and entomology, but robotics and A.I. as well. Psychophysics is the study of how the human brain processes a stimulus through the senses and how it makes decisions based on input. This field has been around for about a couple of centuries. Modern neuroscience has until recently eclipsed it. While the field of psychophysics has been used to better understand how the human brain operates, a few remarkable studies have applied it to other animals, to see if they’re guided by the same or similar processes. Several species from single celled amoeba and slime molds, to more complex organisms, such as fish, birds, and mammals, display behavior associated with psychophysical laws. But until this study, these laws have only been applied to singular organisms, not superorganisms. Andreagiovanni Reina is a collective robotics researcher in Sheffield’s computer science department. He was the lead author on this study. Reina told Newsweek; Psychophysics studies the relationship between the intensity of a stimulus and its perception in the human brain. This relationship has been explained through a set of psychophysical laws that hold in a wide spectrum of sensory domains, such as sound loudness, musical pitch, image brightness, time duration, weight. Recently, numerous studies have shown that a wide range of organisms at various levels of complexity also obey these laws.